How to build a Ethereum mining rig diy tutorial part 3: step by step pc assembly guide / tutorial! I’m very excited to share this tutorial with you. I spent some time taking pictures of every component you’ll be working with and every action you’ll be performing. This means that you don’t need to be a guru in order to follow this tutorial’s steps and create your own Ethereum mining rig. I’ve tried my best to describe every step in a simple and clear way. My goal is to help you avoid any kind of confusions or misunderstandings. Nevertheless, if you’ve got any questions, feel free to contact me and I’ll do my best to help you. This is the third part of our Ethereum Mining Rig Creation Guide, and here we’ll see how to assemble your rig in 9 simple steps. We will be using three pieces from our previous tutorial, which are the two aluminum bars and the wooden stick we’ve just mentioned. We need to attach the two aluminum bars to the rig frame, facing downwards. The bars need to be on the opposite sides, facing perpendicularly to the frame they’re attached to. Make sure that the two bars have the exact distance from their respective corners. Then we need to attach the wooden stick to the tips of these bars, as shown in the pictures. Now that the box is ready, carefully place the motherboard on the bottom (which is made of wooden bars). Make sure the board doesn’t touch any metal pieces. Every motherboard comes with a slim red foam carpet. I totally recommend you placing that carpet under the board. Some furniture comes with plastic/wooden/rubber legs. Personally, I’ve used some of those as a support for the motherboard. It works like a charm. Use at least six of those. Make sure that they have the same height. Make sure that the RAM orientation is right. Also, the first slot is the one that’s closer to the CPU port. Unlatch the two plastic latches, so you can place the module easily. If the module doesn’t enter reasonably easy, don’t force it. Instead, take a look at the latches and make sure that they’re completely open. Once the RAM module is installed, latch them back. Remove the black plastic cover by pulling the spot that says “remove” (images 2 and 3). NOTE: pull it only from the spot that’s marked. Unpack the CPU and carefully place it in the slot. The CPU chip has a tiny marker (either a circle or a triangle) in one of its corners. Make sure that it aligns with the same kind of marker on the port. This step is essential, no matter if you’re using the stock cooler or a third-party one. First of all, we need to remove the stock thermal compound. Use a dry towel or soft paper; avoid using water or any other cleaning substances. Now that the surface is clean and shiny, let’s apply the new thermal compound (image 1). The thermal compound needs to be applied to center the CPU metallic surface. You’ll notice that the thermal compound syringe has some circles. Those are meant to help you to apply the right amount of compound. Once “circle” of compound is enough. Place the cooler on top of the processor and move it a little, so the paste can be evenly distributed between the two surfaces. Attach the cooler and then plug in the fan cable to the motherboard. 1 PCI-e (image 5). If you have more than one video card, you’ll be using multiple PCI-e ports. Carefully plug every cable to its respective port, as shown in the pictures. Double check the installation. My SSD came with a SATA Data cable (image 1). I’ve connected my SSD to the motherboard SATA slot (image 2), using the SATA Data cable. Then, I’ve connected the SSD to the PSU though the SATA Power cable. The SATA slot can be located in one of the corners of the motherboard. Carefully un-box the GPU card and remove the plastic protection (that plastic bar that protects the pins on the bottom of the card). 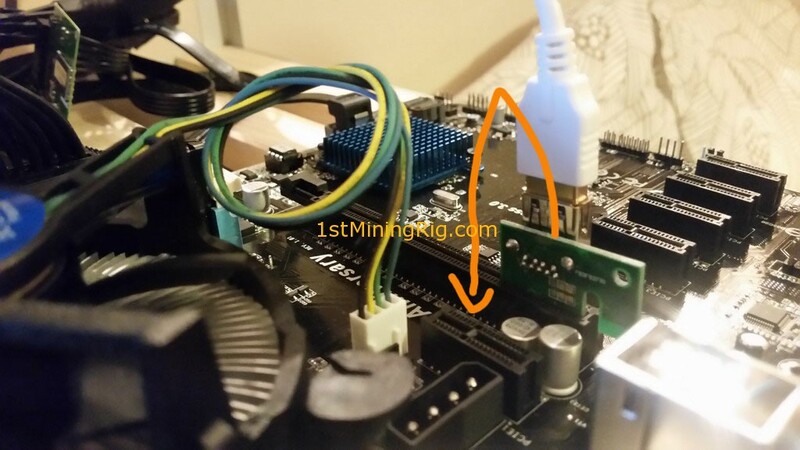 Then, connect the two riser pieces using the USB cable, plug in the power and attach the largest riser piece to the GPU card. Now that you’ve got that done, place the GPU inside the rig box on that wooden bar you’ve installed earlier in Step 1. Use a two-sided duct tape to secure the GPU board (make sure it won’t fall down), but don’t screw it yet. Finally, connect the Molex and PCI-E cables to their slots. The Molex connect the PSU with the GPU, while the small USB riser board goes to the PCI-E slot on the motherboard. You’ll have to connect 4 cables, two of which stand for power and two for reset. Reset cables are usually blue and white, while the power ones are black and red. They also have tags on the plastic tips, so make sure that you connect the right cable to the right place. The 20-pin panel is marked anyway, so make sure to take the time to read the markers. The Ethernet cable connects the motherboard with the router. The ports are easy to find and cannot be confused with anything else. The Ethernet cable usually comes in light blue, light gray or yellow colors. Oh, and don’t forget connecting the mouse and the keyboard too! That’s it, now that everything is set up, we can move to the next part and begin the ethOS configuration for our video card(s). 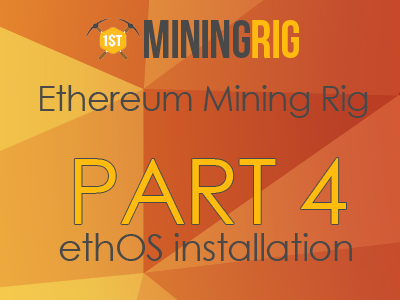 In part 4 you’ll learn how to install and configure the needed software. Unplug the keyboard, mouse, HDD/SSD, GPU and try booting again. If it won’t boot this way, then either the CPU or the RAM is flawed. Now, if it does boot this way, then the problem is in one of the components you’ve just unplugged. You should start testing them one by one: plug the keyboard first, and see if it boots. If it does, then add the mouse, and keep plugging more components until you find the one that causes the problem. Note: If the problem is in the riser, try changing the slot from PCI-E 2 to PCI-E 1. If it won’t work, then try replacing the rises. In fact, I ended up replacing mine. How to Mine Storj & How Profitable Is It?